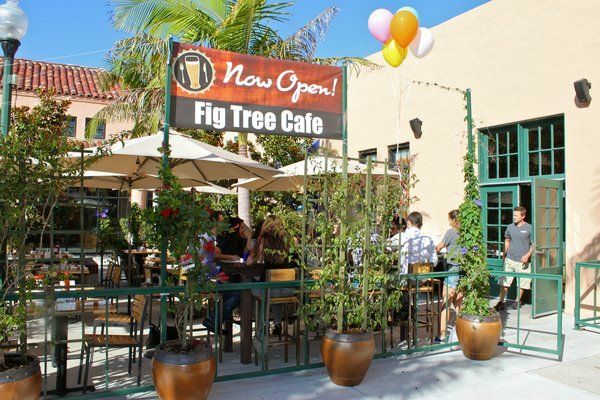 The Fig Tree at Liberty Station has a warm inviting feeling along with menu which offers up chicken, pork chops, burgers and beefy, tender ribs in more than a few dishes. Sunday 4:30-6:30pm: half off specialty cocktails, $6 appetizers (pommes frites, roasted tomato bruschetta, brie & prosciutto, ricotta bruschetta). Monday 4-6:30pm: $5 drafts, house red and white wines, well drinks, $6 appetizers (pommes frites, roasted tomato bruschetta, brie & prosciutto, ricotta bruschetta). Wednesday 4-6:30pm: Half off all wine bottles, $6 appetizers (pommes frites, roasted tomato bruschetta, brie & prosciutto, ricotta bruschetta). Thursday 4-6:30pm: $6 craft beer flights, $9 wine flights, half off flat breads. Sunday 7 a.m. to 3 p.m.
Monday 4 p.m. to 10 p.m.
Tuesday 4 p.m. to 10 p.m.
Wednesday 4 p.m. to 10 p.m.
Thursday 4 p.m. to 10 p.m.
Friday 4 p.m. to 10 p.m.
Saturday 7 a.m. to 3 p.m.
Saturday 4 p.m. to 10 p.m.